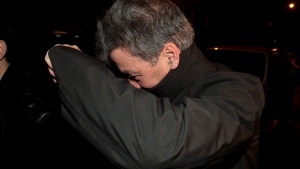 MONTREAL -- Former SNC-Lavalin (SNC.TO) CEO Pierre Duhaime pleaded guilty Friday to a charge of helping a public servant commit breach of trust in connection with a bribery scandal around the construction of a $1.3-billion Montreal hospital. Duhaime was the last defendant in a major corruption and fraud case involving the McGill University Health Centre project. His trial on 16 charges including fraud, conspiracy to commit fraud, using forged documents and breach of trust had been scheduled to start next week. Quebec court judge Dominique Joly accepted a joint recommendation from the Crown and defence that Duhaime receive a 20-month suspended sentence. It will be served under house arrest. Duhaime, 64, is also sentenced to one year of probation and 240 hours of community service. He has been ordered to donate $200,000 to a centre that aids victims of crime. His lawyer provided a receipt to the court showing the donation has already been made. Pierre Duhaime leaves SQ headquarters in Montreal, Wednesday, November 28, 2012. (THE CANADIAN PRESS/Graham Hughes). An agreed statement of facts presented to the court indicated that Duhaime was guilty of "wilful blindness" as chief executive of the engineering firm. The statement said Duhaime did not receive any money from the crime. It added that he was not connected to and had no knowledge of the $22.5-million in bribes paid to then-CEO of the MUHC, Arthur Porter, and his right-hand man Yanai Elbaz. Elbaz, a former MUHC senior manager, pleaded guilty in December to accepting a bribe and was sentenced to 39 months in prison. Former SNC-Lavalin executive Riadh Ben Aissa pleaded guilty to a charge of using forged documents last July and was sentenced to 51 months in prison. "We have always maintained that those who committed any criminal wrongdoing should be held to account, and in fact, this will be the case," a spokesperson for SNC told BNN Bloomberg via email, who noted SNC "initiated" the criminal investigation related to the MUHC. "There were no charges laid against SNC-Lavalin in this case," the spokesperson added. "Furthermore, SNC-Lavalin has always actively co-operated with the authorities." Duhaime left SNC-Lavalin in March 2012 after an independent review found he had approved $56-million in payments to undisclosed agents. It was a stunning turn after his predecessor, Jacques Lamarre, had predicted Duhaime would take SNC to “new and exciting heights” when he passed him the baton in 2009. In an agreed statement of facts presented in court in Elbaz's case, the former MUHC official admitted to giving privileged information to SNC-Lavalin to help its submission for the contract to build a massive hospital complex in west-end Montreal. Elbaz also admitted to denigrating SNC's competitors in front of the hospital's selection committee. Elbaz and Porter, who died a fugitive in Panamanian custody in 2015, received a total of $22.5 million to rig the bidding process to favour SNC-Lavalin. Porter created a shell company that received the bribe money. Elbaz then created his own shell company and received his share of the cash, the document said. Elbaz admitted that all the money in the shell companies was proceeds of crime. Police raided the MUHC's offices in September 2012. The following February, Quebec's anti-corruption unit issued warrants for the arrests of Duhaime, Ben Aissa, Elbaz and Porter. Porter's wife, Pamela, was arrested later and in 2014 pleaded guilty to laundering the proceeds of crime.